I so love this product. It is so easy to use I don't know why I didn't by one years ago when I saw them. You can do so many apples in a matter of minutes verses hours by hand. I will make more apple recipes now that I don't have to peel, core and cut by hand. Did I say that I love it! It is Great!! Sure beats peeling by hand. My grandsons love apples,this is a fast way to give them what they want. This was bought for a family with 7 kids. The older 4 girls are experimenting with cooking. This will come in handy not just for eating, but for holiday baking. I told them about mine and they were interested, I got this one as a surprise for them. Bought this for my husband. He loves apples but needs them to be cut up to eat them. He loves it. I purchased a second one to give to my Dad for his birthday. I know he will love it too. This is great. I have one for myself and gave one to my father for xmas. It peels, cores and slices. It's very easy to use and wastes very little apple. Very good for making apple pie! only issue: doesn't work as well with really big apples but isn't that big of an issue b/c you can save a lot by getting the small bags of apples. This is a very quick way to help make an apple pie. This was actually a replacement, as when I moved out of my home into an apartment it got lost. I always make several pies in the fall and freeze them for use later in the year. Peeled bushels of apples, and pears. Saved hands from hurting; and got them done in a 1/4 of the time. Easy to use and wash. It is a great tool. Nearly perfect! takes out the core making rings of the fruit, sometimes we needed the fruit whole! 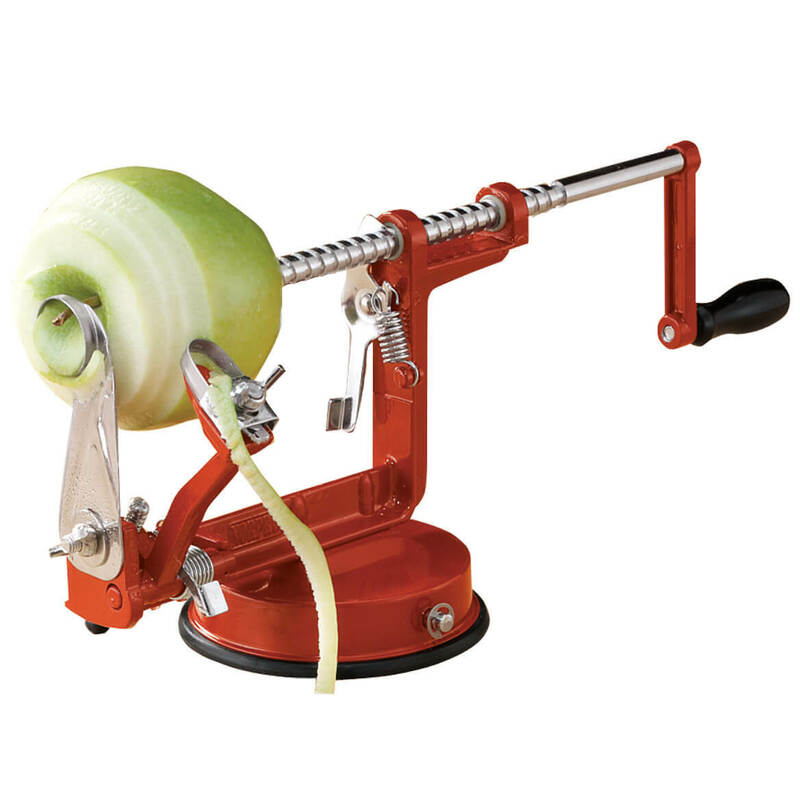 I use this product for the combined function of peeling, coring and slicing apples, though I understand it can also do the functions separately or be used for potatoes. I make many things with apples--pies, cakes, fritters, etc.--and the most burdensome part was always peeling, coring and slicing them. It was a very time-consuming chore and often left my hands sore. This gadget makes it an absolute breeze! It peels, cores and slices an apple into thin, uniform slices literally in just seconds. All you have to do is put the apple onto the prongs and turn the handle a few times. It is well constructed, takes up little space, and is easy to clean. I consider it the best kitchen aid I've ever bought. I love the well built construction very sturdy and easy of use, especially if you enjoy apples I even eat the cuttings super convenient. I use this almost daily to peel, slice and core apples for my lunch and snacks. I also use it to peel, core and slice apples to dry in my dehydrator! I don't know why I waited so long to get one and I love it! It's so great, I ordered 10 more and gave these away as gifts last Christmas and everyone loves them. As long as you get the apple cenetered on the prongs (it takes a few times to get the hang of it) it works like a breeze. I have also used it to peel potatoes with great results. The construction is very good. I did find it a little difficult to use. It gets better with experience. great product wish I had ordered sooner. 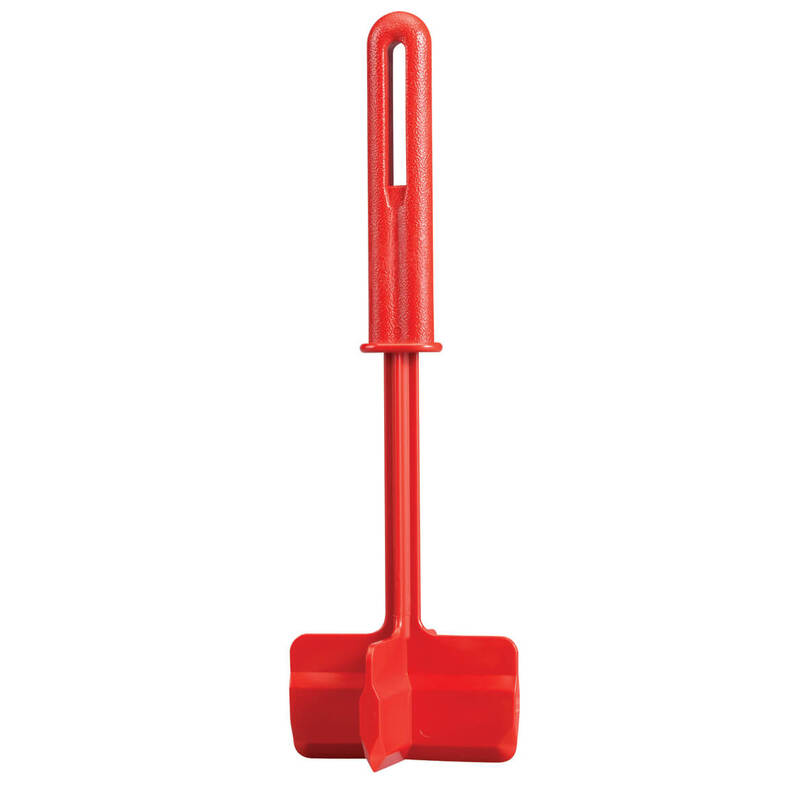 I use the peeler for apples it peels great and fast. Instructions not clear, but figured it out. This little gadget will peel an apple in seconds! When I first got it, it was taking off too much apple with the peel. But, following the directions to adjust it was super easy. I would have given it 5 stars except for a tiny half moon washer that enables the suction to work. It fell off unknown to me (I didn't even know it was there) and I couldn't figure out why the suction stopped working. Luckily it fell off on the table and with a bit of experimentation, I was able to figure out where it went. I check for the washer every time I take it out of the box and make sure it is securely attached when I put it back in. I have not yet tried it on potatoes. If I get hungry during the night, I sometimes get up peel an apple (BTW, it cores and sliced when it peels) and eat it in bed. Going to be a Christmas present. Works great for peeling and slicing apples. harvested 18 5 gal. buckets from them this year. Can you think of how many apples we have pealed so far? My aunt used to have one of these a long time ago but hers only pealed the apples. I am anxious to see how the other features work on this when I receive my machine. I'll write another note after I get it. I love the peeler, but I am having trouble finding parts for it. Solid steel, locks down, easy to assemble. I believe this will work wonders if you use the smaller apples-green ones etc. I tried to make applesauce using up the large red delicious apples and they were just to big to try and get the job done. I borrowed a granny green from my neighbor and this one went perfectly through the peeling, slicing process. I also tried peaches, didn't work to well even though they were hard. Skin is too thick. It's getting to near fall so I wanted to save time this year in making apple bread, pies, tarts etc. Also tried the yellow delicious and didn't work, too big. I may try a nectarine next week. I love to make fruit pies etc. Hope this helps you. Well made product. Not as easy to use as it seems. There needs to be better or clearer instructions on how to use. Also the suction clap and suction surface does not work very well. It also take a lot of practice to set the cutting blade correctly. Also...the blade skips over the apple peel so only parts of the apple get peeled. Was disappointed that it did not peel the apple. It did a good job coring and slicing. This device is not a very well made product. The nylon bushings (that were brass on older models) ,that the main shaft runs in, wears out after a very short time. The knife is so flimsy that it bends really easy (with good Granny Smith apples). The pegs that hold the apple push back out of its holder shortly after its first use. Waste of time and money, doesn't work worth a dang ! so I can peel all my apples easier. Due to hand problems, it will help. Niece has one and looks like she uses it a lot. We are getting older and hands hurt doing peeling. This looks like the answer. I love apples they are my favorite thanks! I love to cook homemade fried apple pies. I was tire of trying to dig the core out. Hope this works as good as I think it will. Make smoothies & F.F. easier. Love to cook and bake. This will be very helpful as I had one before . 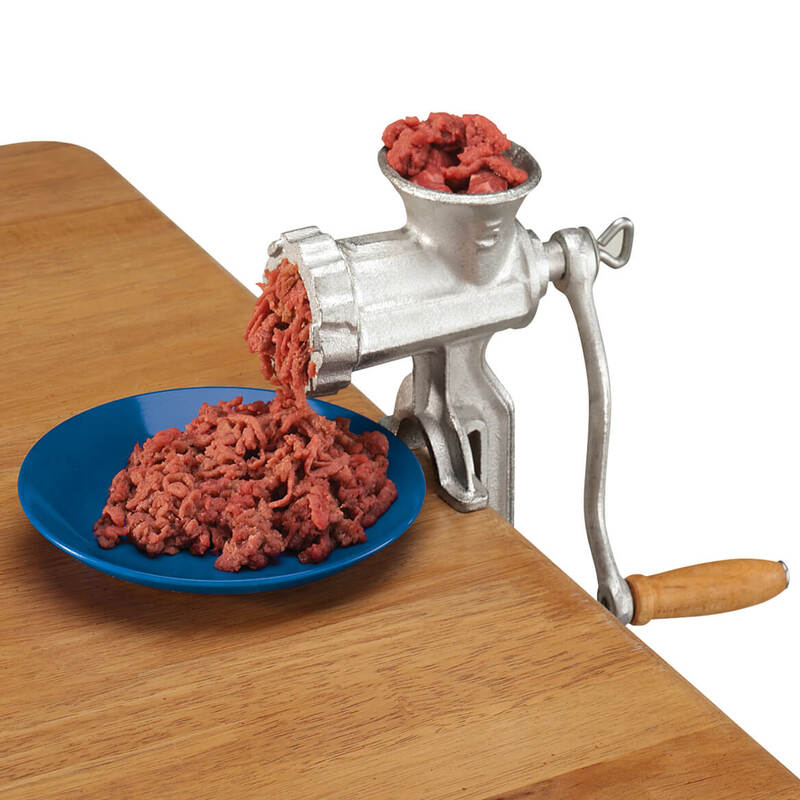 Been thinking about purchasing one for years. I bake a lot and my hands get tired peeling apples with a knife. I saw one of these in an older catalog and thought it would be a great item to have! My husband loves apples but was having a difficult time peeling and quartering the fruit. Hopefully this will help him be able to continue to enjoy apples. I love to make applesauce but the coring and peeling take so long! my mom has one and it works great! Had one for years till it wore out want another one. For ease in making apple pie. I bought this as back up; I have one already. I bought a bushel of various apples last year ad this made short work of my prep time. The peelings can be boiled to make apple jelly too. I taught my great grandson how to use it and now when the kids are here and want an apple, I just let them peel their own. 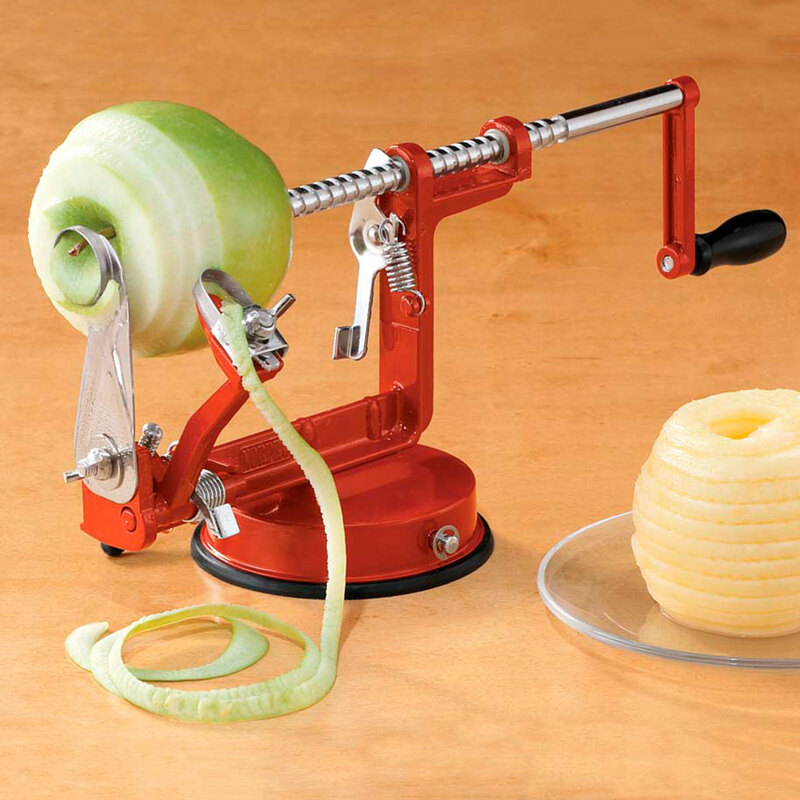 I've been wanting an apple peeler for quite a while and this cores too!!!! Can't wait to receive it. To make peeling apples simpler and faster. I had one of these for years and it finally died. Need another one. I like the suction cup advantage. I love how this works! I have the table mount type now but my sister has this one and it works fantastic. It looks like the original one I had for years. I hope this one is sturdier than replacements I have purchased. does this work with peaches? BEST ANSWER: I have an idea that it would not work well with peaches due to the fact that the prongs that you push into the fruit would be stopped by the stone of the peach, and so you may not have a firm grip on the fruit. If that could be overcome somehow, I think the peeling process may work fine, especially if the peaches are firm. No, it's NOT meant for stone fruits...drop your peaches into boiling water (after you make a small X on the bottom) for 15-20 seconds and then into icy water and the peels slip right off. I only used it for apples, so I don't really know. Is it Dishwasher safe? If not, how do you clean it? BEST ANSWER: I never put anything metal in the dishwasher. But it's very easy to clean - just rinse & air dry. It's my husbands' favorite "toy" in the kitchen now. Thank you for your question. 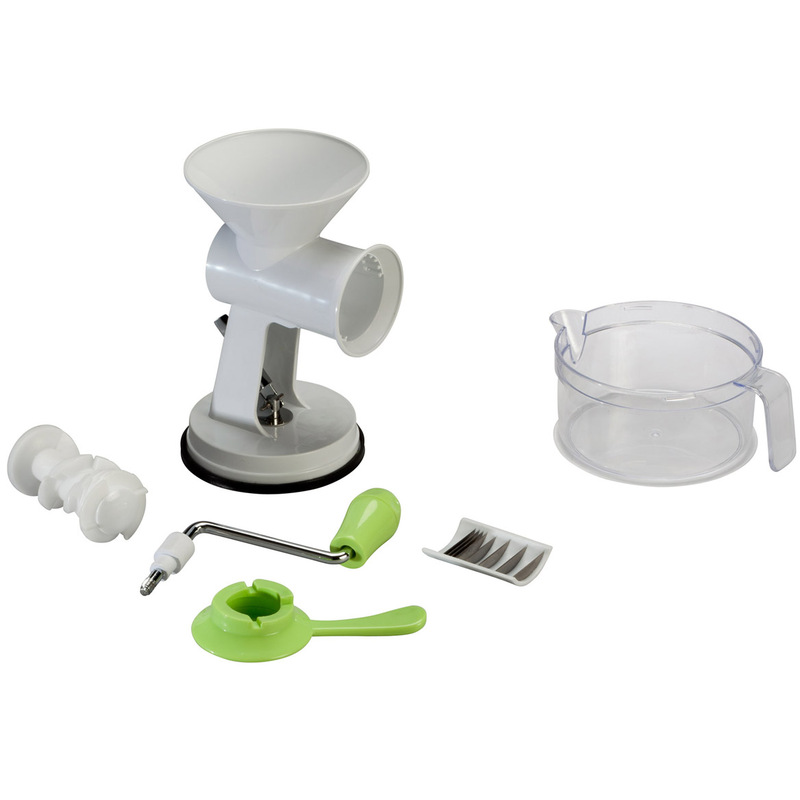 The Apple Master Peeler/Corer/Sliver should be hand washed. We hope this information will be of help to you. how do you take of the suction cup to tighten the screws? BEST ANSWER: Thank you for your question. It does not need to be removed in order to adjust. Instructions will also be included in the item. We hope this information will be of help to you. can I adjust slicer width? BEST ANSWER: no, it can not be adjusted. in addition, it only uses small apples and needs to be aligned carefully with each apple. i rarely use mine. Thank you for your question. The slicer width is set and cannot be adjusted. I Bought the apple slicer for my daughter for Christmas and so it hasn't been used. NOT THAT I AM AWARE OF,IT WORKS GREAT, OTHER THAN THAT. No. But I think you can adjust thickness of peeling. Can you just core an apple? BEST ANSWER: Thank you for your question. 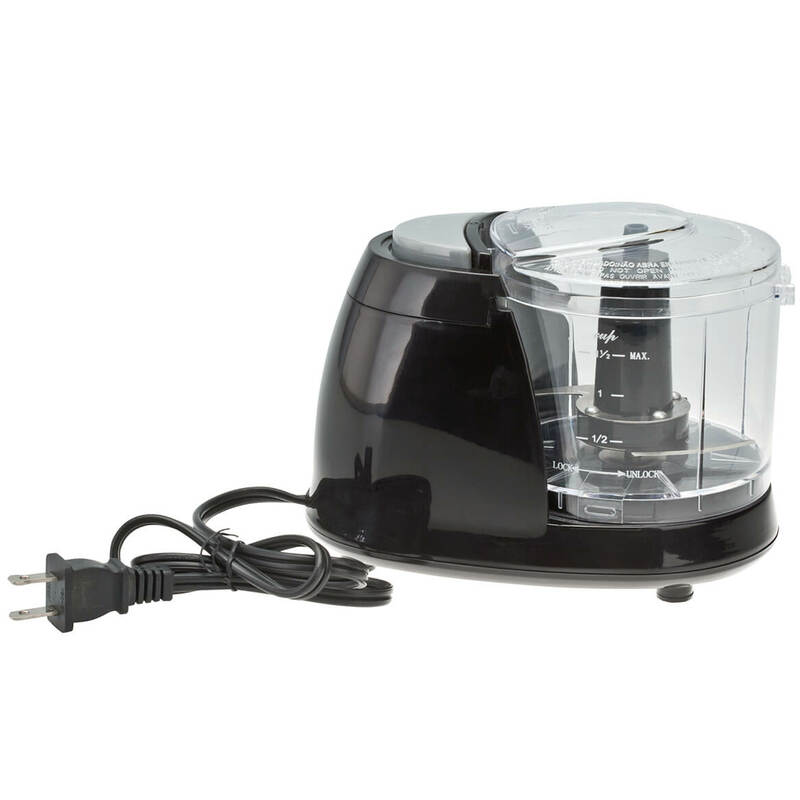 It offers three different functions: pare, core and slice; slice and core only; or pare only—great for potatoes, too.We hope this information will be of help to you. I believe you can set it to not peel the apple, but I think it will still core & slice it. You may have to play with it to see what you can do. It is well worth it if you are making a pie though. It saves so much time. Thank you for replying...glad I am not the only one who has discovered that....and that you cannot just peel either....despite thier description...but thta is ok...I still love it and have had it for years!! Can you just peel an apple? BEST ANSWER: You can peel potatoes, I have used it for potatoes, it does pretty fair, but if the potato is crooked it will not do the whole potato so I just leave on the parts that are not peeled and cut up how I need to and use it anyway. Straight potato, peels all. what did you do to the machine to peel a potato and not slice it and not have a hole in the potato? I loosened the corer for the apple and lowered it out if the way, works pretty good, I just ordered one for my grandaughter. Thank you for your question. 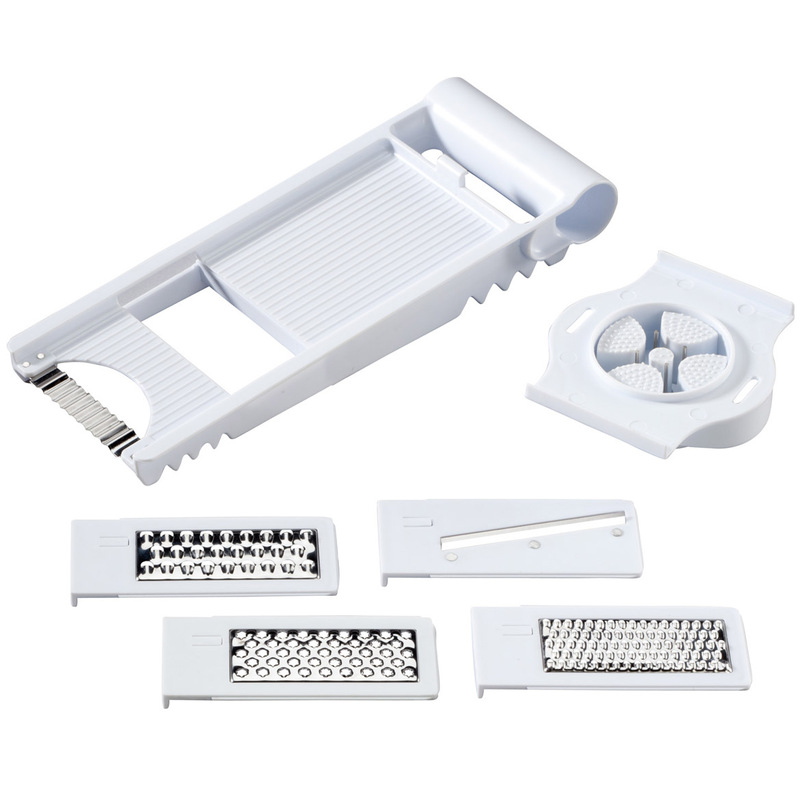 It offers three different functions: peel, core and slice; slice and core only; or peel only—great for potatoes, too. We hope this information will be of help to you.